Vaughan received the top award during the 2019 Illinois Head Start Association’s Annual Conference from March 27-29 at the Bloomington-Normal Marriott Hotel and Conference Center. Vaughan’s four-year-old daughter, Nyomi Zackery, has been at the Lovejoy Head Start Center since 2017, and Vaughan has served as a parent volunteer since that time. Vaughan sees herself as a school partner, because the mother of two is resolute about teaching her children at home. “I wish there could be Head Starts through high school, because of the structure they provide,” she continued. Vaughan will be among one of many to receive accolades and awards at the SIUE Head Start/Early Head Start Parent Awards Luncheon at 11 a.m. Friday, April 12 at Our Lady of the Shrine Restaurant and Banquet Center in Belleville. Photo: Lateyka Vaughan, of Brooklyn, is the 2019 Illinois Head Start Parent Teacher of the Year. 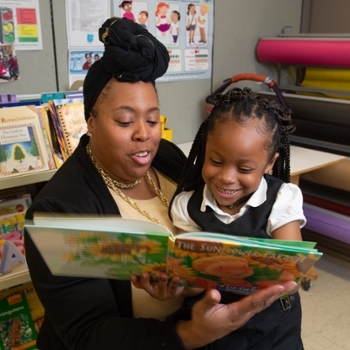 Her four-year-old daughter, Nyomi, is a student at the Lovejoy Head Start Center.